An exploration of the East Anglian royal ship-burials and how our understanding of the rite of ship-funeral is amplified by Old English verse. We embark with a look at the archaeology of the Wuffing ship- and boat-burial sites at Snape and Sutton Hoo and a consideration of what the use of a vessel in a funeral rite may imply. 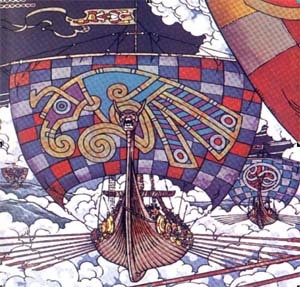 We shall then appraise the literary evidence for this rite, focusing closely on the high culture perspective provided by the epic of Beowulf - the opening movement of which culminates with a splendid poetic account of a royal ship-funeral.